In late 2015, nearly two thirds of US consumers didn’t know if their favorite retailer had a mobile app. Flash forward to today and, in a survey we recently conducted, 48.7% of people said “shopping via apps” is a primary reason they use their smartphones. In just a few years, shopping apps have gone from having poor awareness to relatively high usage. How did this happen? Brands that launched shopping apps early on discovered that apps outperform desktop and mobile sites in terms of average order value, conversions, and overall spend. Meanwhile, consumers grew tired of navigating through browsers to make purchases. They wanted something more immediate — something like an app. And the supply of shopping apps rose steadily with demand. Demand for shopping apps was growing back in 2015, grew during 2017, and will continue to grow in 2018. But rather than demanding more apps, users will demand more from the apps that already exist. Therefore, in our survey, we asked questions about how shoppers are currently using retailers’ apps to make purchases and what they want more of from them. In addition to this, 36% said a push notification triggered by their location inspired an in-store purchase. This aligns with responses in a push notification survey we conducted in which 42% of smartphone users said location-based push notifications caused them to use an app more. Question: Did a personalized push notification influence an in-store purchase you made? Question: Did a location-based push notification influence an in-store purchase you made? When we asked people if they had a recent experience where an email or push notification from a retail brand positively influenced their view of the brand, 58% of people said yes. Then, for those who answered yes, we asked which type of message positively influenced their view of the brand. According to the survey, messages with the most positive impact on brand perception are based on previous purchase behavior. Sixty-two percent of people prefer this type of message over a message that is location-based (20%) or seemingly random (18%). So, while location-based messages can be effective at getting people to buy in-store, they aren’t as effective at positively impacting brand perception. Question: Which type of message positively influenced your view of a retail brand? As mentioned in the first section of this post, almost half of people made a purchase in-store after receiving a notification that was personalized with their profile data (e.g. previous shopping behavior). But the majority of them are still uneasy about being tracked and remarketed to online. In the survey, we asked people how they felt about this type of experience: You view a product online or in a mobile app → You get an offer for that product in your email inbox or via push notification → You see an ad in your social media feed about that product. Forty-two percent responded positively to remarketing and 41% said remarketing makes them feel nervous. This means personalization is still polarizing and there's a fine line between doing it right and potentially turning someone off. Question: How do you feel about being remarketed to after viewing a product online or in a mobile app? To round out the survey, we asked people what they want from shopping apps that they’re not getting today. We provided 11 responses/features and requested survey participants to select their top five in order of importance. You can view the full list of features included in the survey and how people ranked them in this image or this .csv file. Using shopping apps to engage people at every stage of the buying journey is becoming more important for mobile marketers in retail. In addition to functioning as powerful purchasing platforms, these apps can be used to inspire offline purchases, enhance transactional experiences, and collect data to re-engage potential buyers with the right product at the right time. Try using shopping apps to drive in-store purchases. Almost half of people surveyed said a push notification influenced a purchase in a physical location. 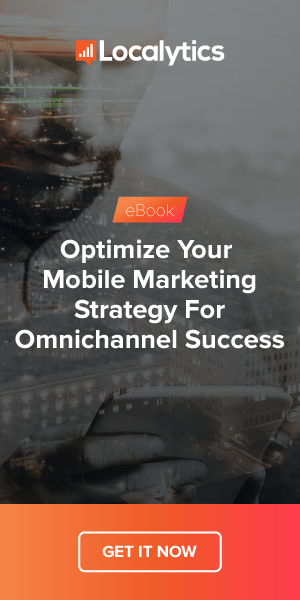 And with tools like Audiences and Places, mobile marketers can easily create push campaigns based on shoppers’ profile data and location to incentivize store visits and target people on the go. Send follow-up messages to buyers. Sixty-two percent of people view a brand more positively when messaged after making a purchase. This can be anything from a mobile receipt to a coupon that incentivizes the shopper to make a future in-app purchase. A push notification tool makes sending these types of follow-ups easy. Only remarket to people who show real interest in products. You can assume that people who abandon a shopping cart or view a product three times in a day/week have an intent to buy. Remarket to people like this and think twice before remarketing to people who only view a product once or never make it to the shopping cart. Also, since conversion rates are higher inside mobile apps, consider using a mobile app remarketing tool to re-engage people when they’re on their mobile device and bring them back to specific product pages. This post is based on a survey that was conducted by Qualtrics on behalf of Localytics in November 2017. The survey collected responses from 1,000 smartphone users based in the United States, of which 487 said “shopping via apps” is a primary reason for smartphone usage. Those 487 people were asked the questions mentioned above. There was a fairly even split in women (267) and men (220) and also a fairly even split in age range. If you would like more granularity into the responses, let us know in the comments below. We can break out responses with other questions asked in the survey.